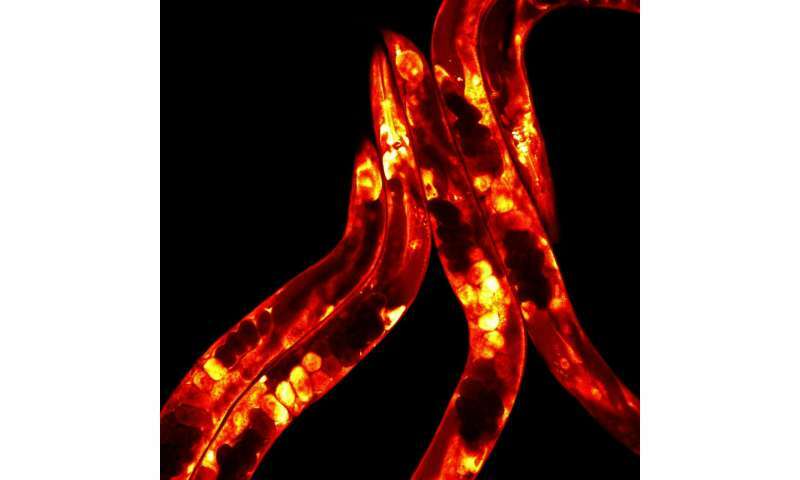 C. elegans worms labelled with a fluorescent protein and imaged using a confocal microscope. The image shows worms that are genetically identical but that exhibit inter-individual variability in stress response gene expression. Credit: Dr. Laetitia Chauve, Babraham Institute. What can worms tell us about human ageing? A lot more than you'd think; as research led by the Babraham Institute but involving researchers from multiple disciplines drawn together from across the world has shown. In a cluster of papers, the latest of which is published today in Frontiers in Molecular Biosciences, the researchers describe how a collaborative effort has developed a single agreed model of metabolic flux in a tiny worm called C. elegans, and how Babraham Institute researchers have used this model to understand more about the link between metabolism and ageing. Metabolism fuels life; converting food to energy for cellular processes and ensuring a supply of building blocks to meet the organism's needs. Importantly, metabolism plays a key role in modulating longevity, as many of the genes that are known to extend lifespan do so by altering the flow of energy and signals in cells and across tissues. There is demonstration of this relationship shown by the influence of diet and severe calorie restriction on lifespan in many organisms, including humans. "One major barrier for fully exploiting the potential of C. elegans as a research tool was the lack of a model uniting everything that was known about C. elegans metabolism," says Janna Hastings, a Ph.D. student in the Casanueva lab at the Babraham Institute. "To overcome this, we initiated a global team effort to reconcile existing and conflicting information on metabolic pathways in C. elegans into a single community-agreed model and launched the resulting WormJam resource in 2017." "One of the key challenges that we face when studying ageing is that the modelling tools available are optimised for animals or cells that are in the process of growing, which is not happening in aged animals," explains Dr. Olivia Casanueva, group leader in the Epigenetics programme at the Babraham Institute. Mitochondria are the powerhouse of energy production in the cell and their declining function in older humans may be central to ageing and many age-related diseases such as Alzheimer's. The researchers asked whether the new optimised tools could predict which metabolites produced by the mitochondria might be most affected by age. "The model prediction was quite accurate, as it predicted that Oxaloacetate, a key resource for the production of energy, was becoming limiting in aged worms," said Dr. Casanueva. "We know that of all metabolites that can be supplemented to the food source for ageing worms, Oxaloacetate is the one metabolite that produces the most robust effect—extending lifespan by up to 20%." "This re-optimisation of the model for ageing animals represents a significant technical advance for the field and will allow more accurate predictions of metabolic fluxes during the course of ageing," concludes Dr. Casanueva. "By developing our understanding of the experimental model of ageing, we can gain valuable insight into what's happening in humans—taking a step towards achieving healthier ageing."